Chestnuts roasting by an open fire is not merely a line from a popular Christmas song, but also an apt description the way to prepare a tasty and healthy winter, New Years or holiday treat. Here's how to make your own roasted chestnuts, easily with photos for each step! Step 1 - Select your chestnuts. 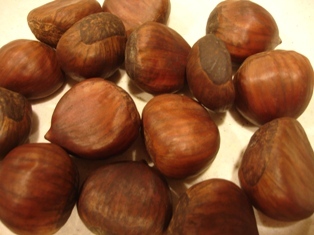 Chestnuts are commonly available in most large grocery stores; pick your own farms are quite rare for chestnuts. 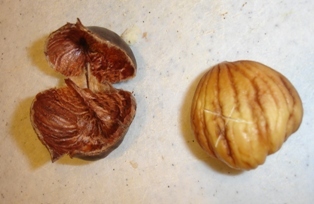 Look for nuts that are firm, with some flex in the shell. When cut open, the flesh should be yellow and firm. 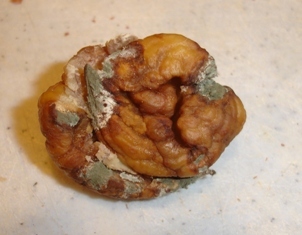 A bad chestnut may be moldy (see photo at right) or mushy. 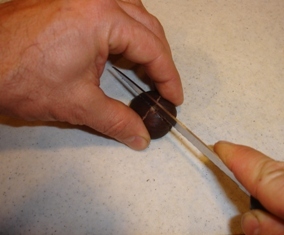 You must make a small notch (an "X") or cut in the round side of every chestnut. A serrated knife is a bit easier to use. This is important, because it prevents the nuts from exploding like popcorn, from trapped moisture! Get the oven heating to 400 F (205 C). Spread the chestnuts on a baking pan, cookie sheet or baking dish with the flat side down. Spray or sprinkle the chestnuts with a few squirts o f water. Put the baking dish in the 400 F oven, Roast for about 8 to 10 minutes on one side, flip them over (or just stir them to flip them) and then 8 to 10 more minutes on the other side. I can't tell you more precisely than 8 to 10 minutes on each side, because each batch of chestnuts varies somewhat based on the variety, how old they are, dryness, etc. After a total of about 15 to 20 minutes in the oven, they are ready! Best served very warm, but you will want to want until the cool enough to handle safely! 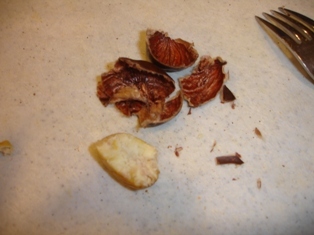 Peeling the chestnuts is pretty easy with your fingers or a fork. When the cool completely, they are more difficult to peel and lose much of their flavor! Chestnuts roasting by an open fire? If you'd rather roast them the old-fashioned way, you can use a fireplace popcorn popper pan or simply place then close to the edge of the fire to roast the chestnuts over the coals. Kitchen stores often sell a chestnut roasting pan to use over a fire or stove. It looks like an iron skillet or pan with holes punched into the bottom of it. 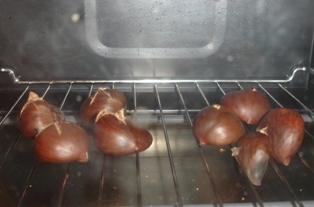 Next, put your carefully chosen chestnuts into the pan and sprinkle them with water. Cover the chestnuts and put the pan over a medium heat. Then, shake your pan frequently while roasting until you see that the skins have blackened and have pulled back from the chestnut meat (you'll notice this where you made the cut previously). Roasting them should take about 5 to 10 minutes. If the chestnuts appear too charred, then that means you didn't shake the pan enough. You'll know when they are roasted to perfection by the fact that you can easily open the shell and find beautiful golden colored chestnut meat inside. It's sweet to the taste and a little crumbly in texture.